Sometimes Baseball Tips about certain information just don't fit neatly into a larger subject and they tend to get overlooked or forgotten. Such is usually the fate of the following tips which will help your game improve immensely. The longer You can see it … the Better Chance to Hit it. Simple statement of truth, especially when hitting a moving baseball, but how do you maximize the time you can view the ball? Find the release point. A Pitcher’s Release Point is the Exact Point the ball leaves his hand and starts to the plate, therefore being able to determine and focus on this release point, affords you the maximum time to see the ball before having to swing or not. (1.) As the pitcher begins, and continues through his windup, locate the Logo on his cap and keep your eyes on it. (a.) 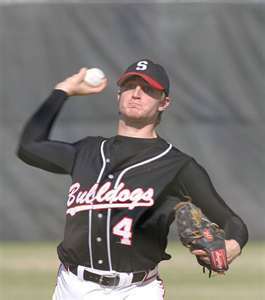 A good pitcher is taught to bring his arm at a right angle to his head and bring the ball past his ear as he delivers. If you’re Watching the logo on his hat the distance your eyes must travel to locate the baseball in his hand, is reduced to its minimum. (b.) Remember … there’s a difference between Watching and Focusing. To focus on the logo means you can see nothing but the hat’s logo, which is Not what you want to do. To be watching the general location of the logo allows your eyes to nearly instantly pick up his hand and ball as it approaches the release point. (c.) Secondly, Don’t confuse “by his ear” as meaning within inches of the ear, because that‘s not the case. His arm will be extended at a right angle, to the ear …. so don’t get hung up on looking at the ear. (1.) You are able to quickly pick up the flight of the ball, which allows you the maximum time to see it and decide whether to swing or not…. (2.) By watching for 1 point only, you’ve eliminated the distraction some pitchers attempt to produce by employing a herky jerky or unusual pitching motion, which has you searching for the ball while trying to ignore legs, feet or other distractions. As a hitter the worse out you can make is a Strike Out. (a.) It deflates the hitter’s confidence, which can affect his entire game performance. (b.) It inflates the pitcher’s confidence. (c.) It’s the Most Unproductive Out a hitter can make, such as failing to move a runner over a base or drive in a run home. Obviously reducing, eliminating would be nice, but unrealistic, strike outs is a main goal of hitters, and there are many variables which could contribute to less strike outs, but here’s a hint you may have never thought of or heard of before. The longer you can wait on a pitch before having to swing, the less chance you have of missing it when you swing. Sounds a bit elementary, but let’s not take this little tip at face value, but let’s seriously exam it. (A.) 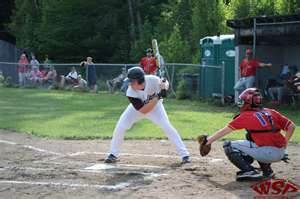 Taking your batting stance at the plate pretend you are hitting the ball a few inches out in front of the plate and slowly swing the bat until making imaginary contact with the ball. (a.) Now, estimate the distance your bat traveled from the cocked position to striking the ball. Maybe 3’ to 3 ½ ‘ educated guess. (B.) Now perform the same swing, only hit the ball deep in the box as the ball crosses the back half of the plate. (b.) Now measure your swing to contact. Perhaps 2’. The exact distance doesn’t really matter, what matters is the shorter the swing is before hitting the baseball, the less chance you have of missing it. (c.) Therefore, it stands to reason moving back in the batter’s box will shorten your swing and allow maximum viewing time. Although you wouldn’t necessarily use this strategy of hitting at every bat, a situation of contact being crucial and a strike out, devastating, pull this Tip out of the memory banks. In many cases, such as a wide throw to first base, the fielder does whatever he can to tag the runner out, so there isn’t really any standardized or proper method for performing the tag. Do what you gotta do. However, there are basic ways to tag a runner Sliding into a base …. And there are basic No … No ways. I have seen infielders covering second base on a steal attempt, which after receiving the ball from the catcher, would bend and hold with the ball knee high, waiting for the runner then swiped down to tag the runner as he slid into the base. This is a recipe for disaster ! (c.) Or the umpire may consider the runner slid under the tag and call him safe. I have also seen the infielder stand in front of, or have a foot in front of the base while performing the tag. This could result in everything listed above, Plus injury resulting from an unnecessary collision with the sliding player. (b.) Straddle the front corner of the base and place your glove On the Ground in Front of the Base. (c.) Allow the runner to slide into the tag. Never take your eyes off the runner assuming he’ll slide into the tag. He may come in standing up or try a fade away slide to avoid the tag, which both actions to avoid your tag is easily countered by adjusting the tag, but you must see them happening. Regardless of what level or age of baseball you’re playing, there will always be the same miscues or mishaps which occur in little league baseball, as there is up to and including Major League Ball. The Only, and big difference, between little league and the MLB, is how the player handles the mishaps and miscues and one such instance is the Dropped Third Strike by the catcher. (a.) Moving quickly means there’s a plan and it needs to be quickly implemented. (b.) Panic means something went wrong and I have no idea what to do about it. Huge difference. The catcher’s number goal after dropping the 3rd strike is to retrieve the ball and throw the runner out at first. (a.) The catcher should retrieve the baseball and Automatically take 2 to 3 steps into the infield, in order to obtain a clear and unobstructed view to the first baseman and throw the runner out. (a.) 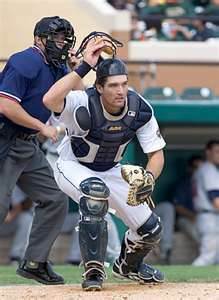 The catcher should Automatically take 2 to 3 steps in foul territory towards the dugout to obtain a clear path to first base and throw the runner out. Although this is a standard play which is practiced, or should be, the key tip is the Automatic reaction to the location when retrieving the ball, eliminating any delay or indecision on the player’s part. 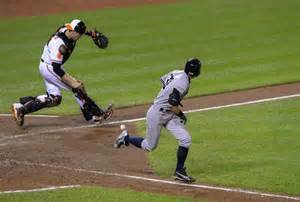 You must remember there’s a player running as fast as he can to get to first base ahead of the throw.